Chris Barton and Don Tate collaborated on last year's successful picture book biography, The Amazing Age of John Roy Lynch. 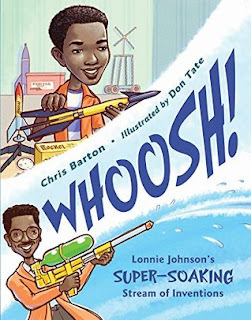 I'm pleased that the duo is back with the engaging picture book about engineer, Lonnie Johnson. Johnson was a creative and inventive child who tinkered on projects and built rockets at home in Alabama. He went on to build a robot for a science fair in 1968. Later, Johnson had an important role in NASA's Galileo probe to Jupiter. He was tasked with creating a "lightweight backup system able to keep essential functions going" if power was lost. Young readers will be especially interested in how Johnson used his knowledge of science to invent the Super-Soaker water gun while working on a new cooling system for air conditioners and refrigerators. Barton's narrative captures the essence of the determined Johnson. Tate's digital, cartoon-style illustrations have lots of kid appeal. The word "WHOOSH!" is effectively placed on several pages adding a sense of excitement and joy. Whoosh! 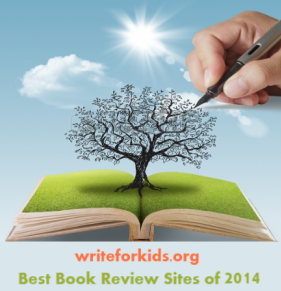 is an inspiring story that will make children delight in what is possible. Put Whoosh! into the hands of students who are assigned to read a biography for class. They will thank you! Be sure to read the author's note explaining how Barton came up with the idea for the book (hint: librarians are involved). Read Don Tate's blog post about interviewing Johnson and doing research for the illustrations. Check out Chris Barton's blog post about NASA's Juno spacecraft. This looks like such a fun book! 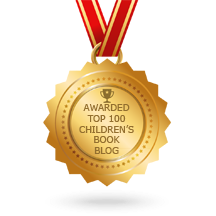 Would you be interested in sharing your post with the Diverse Children's Books Link-up? You can find it at http://pagesandmargins.wordpress.com/2016/07/02/diverse-childrens-books-link-up-july-2-15/. Thanks!